It’s great to have an opportunity to share a book about Member Care in English which doesn’t originate from the UK or USA! 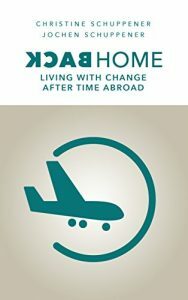 Jochen & Christine Schuppener’s helpful book Back Home which was published a couple of years ago has now been translated from German and is a welcome addition to the library of material available for those negotiating the pitfalls of return to their ‘home’ country after a period abroad. Helpfully divided into four sections – Leaving, The Move, Arrival and Reintegration – Back Home is presented in small, accessible, easy to read chapters. Loss of status, chaos and disruption, relating to work colleagues, cultural stress and dealing with grief are all some of the helpful subsections. The Schuppeners’ psychology backgrounds underpin the material to ensure that it is rigorous but they use sufficiently simple wording which helps rather than confuses the amateur. A number of clear diagrams also help to make the point and there are also checklists and tips to create a varied presentation style. Particularly helpful are the frequent references to children or teenagers which can help an adult easily understand why a child may approach the transition in a completely different way to a parent. Plenty of case studies and examples help to root the theory in the reality of the returnee who has lived overseas, with many quotes from people who’ve been through the transition back into their passport country. As the book is not directly aimed only at mission workers, it also include work contexts which is extremely refreshing. Although these may not be directly applicable to returning mission workers, there are good principles in them which will help Christian workers returning to their sending countries for further ministry there. Back Home is available for a very good price on Amazon by clicking here and if you logon through Amazon Smile you can help Syzygy too (find out more about this here). You can read more about the Schuppeners’ and their work on their website.